Though there are many aspects and challenges for a client with Parkinson’s I wanted to focus on the day-to-day in this blog post. The unknowns of the day-to-day caregiving are probably the most stressful for caregivers. Having systems in place of organization will make these situations seem less overwhelming. Living areas, kitchens and bathrooms can be adapted to help the decreasing cognitive and physical abilities of the client. Make sure there are open pathways and remove obstacles, rugs, decorations, etc. that may cause an accident. Put grab bars in bathrooms and even along hallways. Designate hot and cold on faucets with labels. Leave items at chest or waist level so reaching won’t cause falls. You will also need to help with daily tasks, such as dressing, teeth brushing, showering, etc. Confusion and unsteadiness make these seemingly standard tasks challenging. Help them to understand what is going on and proceed slowly, with care and compassion. A very common symptom of Parkinson’s is “freezing.” Help them move around easier by pretending they are walking over something, or rock very slowly back and forth to get moving again. Exercise, to any degree, is very important to ones health and well being. Siiting around will only make their mind diminish as well as the physical aspects. Encourage activity, communication and involvement socially as much as possible. As the Parkinson’s progresses, these things will become more and more challenging to do. Separate tasks into smaller manageable parts to encourage independence. The trenches won’t seem so deep then. 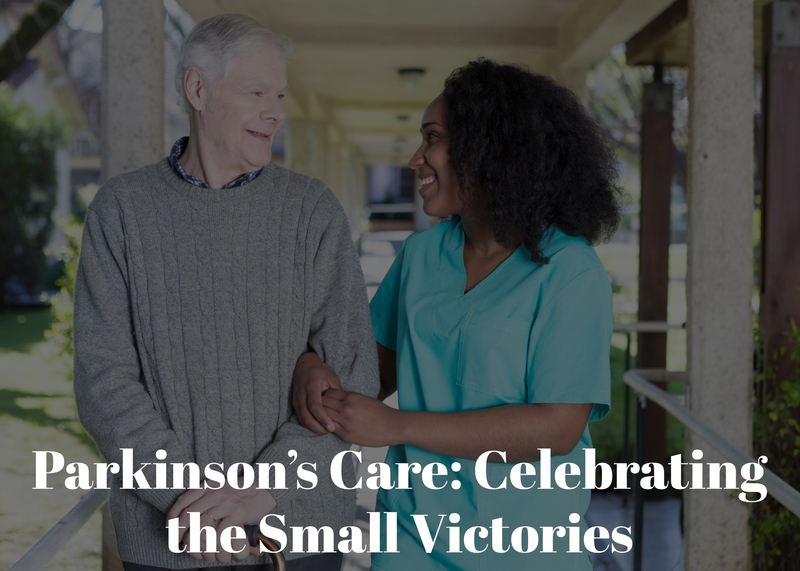 Celebrate small victories in a big way!